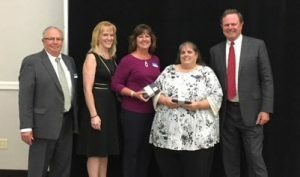 Nearly 50 New Hampshire Mutual Bancorp (NHMB) employees were recognized for five or more years of service at its recent employee banquet. The event celebrated the successes of the nearly 350 community members employed by NHMB, a mutually based company without stock-holders, as well as its community-based subsidiaries: Merrimack County Savings Bank (the Merrimack); Meredith Village Savings Bank (MVSB) and MillRiver Wealth Management (MillRiver). 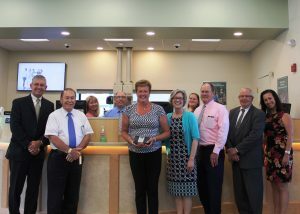 Shortly after this celebration, Savings Bank of Walpole joined the organization as a third community sister bank, sharing mutual (non-stock) status, a similar 150 year history and consistent values. Donna Baron, Branch and Business Development Manager at the Merrimack’s Integra Drive office in Concord, celebrated 45 years of service at the organization. 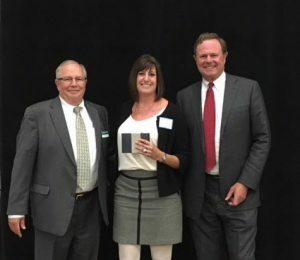 Carol Bickford, Senior Vice President, Residential and Mortgage Lending for NHMB, was recognized for 35 years of service. Additionally, Deanne Lear, Residential Lending Support Specialist for MVSB, Holly Andrews, IRA/HSA Operations Officer for NHMB and Theresa Deegan, Loan Operations Representative for NHMB received awards for 30 years of service. Heidi Stiles, Construction Loan Coordinator for MVSB and Lori Borrin, Vice President, Loan Officer for MVSB celebrated 25 years with the organization. Twenty-year service recognition awards were given to Linda Lorden, Senior Vice President, Retail Sales and Services, the Merrimack; Beth Matthew, Branch Services Representative, Downtown Plymouth office, MVSB; Kelley McGray, Assistant Vice President, Senior Loan Operations Analyst, NHMB; Bette Muise, Loan Operations Representative, NHMB; Matthew Thomas, Mortgage Loan Originator, the Merrimack; Steven Tucker, Senior Vice President, Information Technology Officer, NHMB; Michael Vlahos, Vice President, Commercial Loan Officer, the Merrimack. 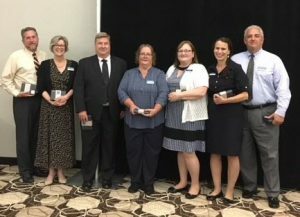 Recipients of fifteen-year service awards included Amy Nyecki, Corporate Finance Generalist, NHMB; Ariel Magoon, Business Applications Support Specialist, NHMB; Judith Horne, Deposit Operations Representative, NHMB; Beth Hurd, Vice President, Credit Administration, the Merrimack; Tara Mudgett, Vice President, Information Technology Operations, NHMB; Brenda O’Connor, Branch Services Supervisor, Moultonborough office, MVSB; Mary Richard, Deposit Operations Representative, NHMB; Karen Seaman, Consumer Loan Processor, NHMB; Sean Skabo, Vice President, Commercial Loan Officer, the Merrimack; Dayna Titus, Assistant Vice President, Deposit Operations Officer, NHMB; Constance Tsirovakas, Certified Teller, North State Street office, the Merrimack. Ten-year awards were given to Kathleen Batchelder, BSA/Compliance Analyst, NHMB; Winnifred Boynton, Branch Services Representative, Ashland office, MVSB; David Cronin, Senior Vice President, Human Resources, NHMB; Kimberlee Gilmore, Teller, Contoocook office, the Merrimack; Kimberly Lesnewski, Branch Services Supervisor, Laconia office, MVSB; Cindy Motta, Vice President, Customer Relationships and Operations, MillRiver; Karen O’Sullivan, Commercial Loan Administrator, the Merrimack; Natalya Pearl, Vice President, Financial Advisor, MillRiver; Susan Ross, Mortgage Loan Originator, MVSB; Alex Sorell, Deposit Operations Representative, NHMB. Employees who celebrated 5-year service anniversaries included Cassandra Allen, Branch Services Representative Trainer, MVSB; Anita Campbell, Senior Internal Auditor Officer, NHMB; Theresa Crowell, Mortgage Opening and Closing Specialist, Mortgage Loan Processing, MVSB; Dawn DiRenzo, Branch Services Representative, Gilford office, MVSB; Oksana Drye, Teller, Integra Drive office, the Merrimack; Lisa Garnett, Loan Operations Representative, NHMB; Robin Guerin, Wealth Management Assistant, MillRiver; Brad Kulacz, Assistant Vice President, Branch and Business Development Manager, Merrimack Main office; Antoinette Olden, Deposit Operations Representative, NHMB; Brandi Taggett, Teller Supervisor, Center Harbor office, MVSB; Brenda Wiswell, Deposit Operations Representative, NHMB. NHMB was recently voted best place to work by the Concord Monitor CAPPIES for the second year in a row and appeared in the Concord Insider’s annual issue this past May. The CAPPIE awards, which represents the Capital Area’s Peoples’ Preferences, is an annual tradition for readers to cast ballots online for the very best in Greater Concord. NHMB received the distinct honor of being voted “Best Place to Work” by public vote. New Hampshire Mutual Bancorp, a mutual holding company, was formed in 2013 when two New Hampshire-based community banks, Meredith Village Savings Bank and Merrimack County Savings Bank, formally affiliated – the first relationship of its kind in New Hampshire. This strategic partnership has positioned the Banks to leverage each other’s strengths as they work together to advance a shared vision of maintaining and enhancing their community banking standards and values. MillRiver Wealth Management joined as a third subsidiary of NHMB in 2015, combining the financial advisory divisions of MVSB and The Merrimack. In July 2018, Savings Bank of Walpole joined as a fourth subsidiary. NHMB is an equal opportunity employer of women, minorities, protected veterans and individuals with disability and is currently hiring for full and part-time positions. For more information, please visit nhmutual.com/careers.